The key to begin reframing in a comprehensive, meaningful, and lasting way is to build organizational and stakeholder support among leadership – such as the CEO and Board members – and external partners. To help secure an organization-wide commitment, craft a clear, concise pitch that demonstrates reframing’s success and significance. Emphasize the key points below to help: 1) ground reframing in the current policy and funding environment; 2) convey the role that narratives play in shaping public support; 3) explain the research that underpins the reframing recommendations; and 4) identify next steps. Highlight specific funding (e.g. state budget cuts) or policy (e.g. eligibility requirements) issues that impact your organization and the people you serve. Key Point: The sector has struggled to build meaningful public support for human service programs and policies. As a result, human services are inadequately funded and public policies are frequently designed without tapping the sector’s deep knowledge and expertise. Point to cuts or stagnation in public funding, private philanthropy, and/or individual donations. Point to policy developments that contradict the realities, needs, and motivations of those who seek services. Example: added barriers to accessing essential services, such as onerous work requirements. Point to government contracting practices that undermine the short- and long-term health of human service organizations. Examples: delayed payments, insufficient allowances for infrastructure and operations, lack of appropriate cost-of-living adjustments. Key Point: The public does not know the full story about the human service sector’s role or value to society, which limits the public’s support and engagement. Point to research showing that the public’s common misconceptions about human services, based on ingrained default cultural narratives, limit support for the sector. Examples: focus groups and surveys revealed how the public focuses on individual attributes, like willpower and grit, as determinants for well-being, while sector leaders point to policies, systems, and community conditions. The public’s views impact opinions about services and their recipients. Point to how traditional communication habits reinforce those misperceptions and alienate the public and policymakers. Examples: emphasis on meeting basic needs for people in crisis, highlighting problems without offering solutions, tone that blames policymakers, terminology such as “vulnerable” and “at-risk” that exacerbates beliefs that the sector is for “other people” rather than something that benefits all. FrameWorks, a team of social scientists and communications practitioners, created reports, graphics, and videos to present and augment their research on the deeply held assumptions of the public regarding the human service sector that can be used to support your pitch. Key Point: The National Reframing Initiative’s research-based approach to communications is designed to generate more support for human service programs and policies by increasing the public’s understanding of the sector’s role and its value to society. According to FrameWorks, the results of the Building Well-Being narrative are among the most robust they have seen in moving public knowledge and perception. Utilize the chart titled “Reframing is Most Effective with a Complete Narrative” in this module to show the improvements in public understanding associated with reframing. FrameWorks’ research identified a rigorously tested new frame, the Building Well-Being Narrative, that has been proven to change attitudes about human service recipients, expand knowledge on how human services work, and stimulate support for policies that increase well-being for all. 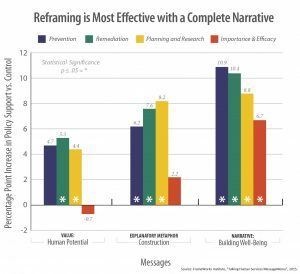 Research shows that reframing is most effective when presenting human services as a story arc that relies on the complete Building Well-Being Narrative (human potential value, construction explanatory metaphor, and the full life cycle). Key Point: Reframing human services takes focus and dedication, but there are practical steps that we can take to incorporate reframing into our communications. The National Reframing Initiative has tools and learning opportunities to help your organization adopt the reframing recommendations. We can also help create a plan for sustainability. Be prepared to propose ideas for how your organization can start to incorporate reframing in its primary communications or new initiatives. Offer suggestions for how to pace your reframing process and prioritize efforts based on your organization’s staff and resource capacity. Example: suggest starting sequentially with the most-used communications pieces that have the biggest impact, such as “about us” language.